Q. Endnote에서 제공하는 스타일이 투고 규정과 다를 수도 있나요? 제가 투고하려는 저널(Scripta Materialia/1359-6462)의 스타일을 지원하지 않아 Endnote 홈페이지에서 다운로드 받았는데 투고 규정과 다른 것 같아 문의드립니다. Endnote는 논문 작성을 조금 더 쉽게 도와주는 툴이지 매뉴얼이 아닙니다. 원하는 Output 스타일이 없을 수도 있고 또 틀릴 수도 있으니 저널 페이지의 투고 규정을 잘 살펴보셔야 합니다. 하지만 테스트 결과 투고하시려는 저널은 적용이 잘 되어 있는 것으로 보입니다. 투고하시는 저널의 홈페이지를 방문해본 결과 아래와 같은 Reference 작성 가이드를 제시하고 있습니다. 핵심이 되는 내용은 1. 본문 내 인용(Citations)과 참고문헌 리스트(References)에 모두 아라비아 숫자로 꺾쇠괄호를 사용하고 있으며, 참고문헌은 저자, 저널명(약어) 볼륨 (연도) 페이지 순으로 표기하고 있습니다. Example: "..... as demonstrated [3,6]. Barnaby and Jones  obtained a different result ...." List: Number the references (numbers in square brackets) in the list in the order in which they appear in the text. J. van der Geer, J.A.J. Hanraads, R.A. Lupton, J. Sci. Commun. 163 (2000) 51. G.R. Mettam, L.B. 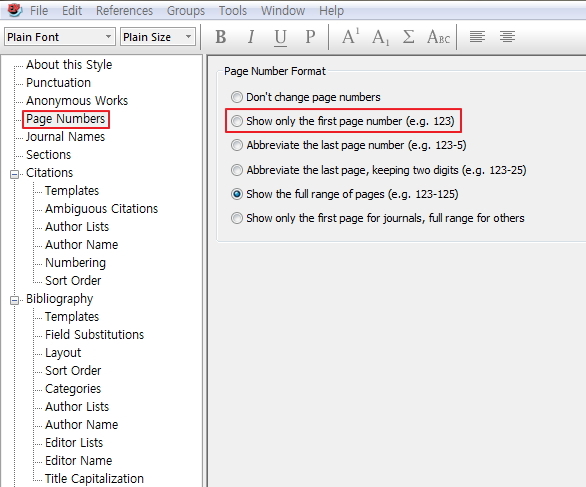 Adams, How to prepare an electronic version of your article, in: B.S. Jones, R.Z. Smith (Eds. ),Introduction to the Electronic Age, E-Publishing Inc., New York, 1999, pp. 281304. 아래와 같이 적용을 하셨는지 다시 한 번 점검해주세요. 문의하신 스타일은 위와 같이 투고 규정에 따라 대체로 적용이 되고 있는 것으로 보입니다. 단, 페이지 부분은 규정 상에는 단일 페이지 번호만 있는 반면 Endnote에는 페이지 범위까지 표현되고 있어 출판사 측에 확인이 필요할 것 같습니다. 만약 페이지 작성방식 등 스타일에 일부 수정이 필요하면 아래와 같이 시도하세요. 1. 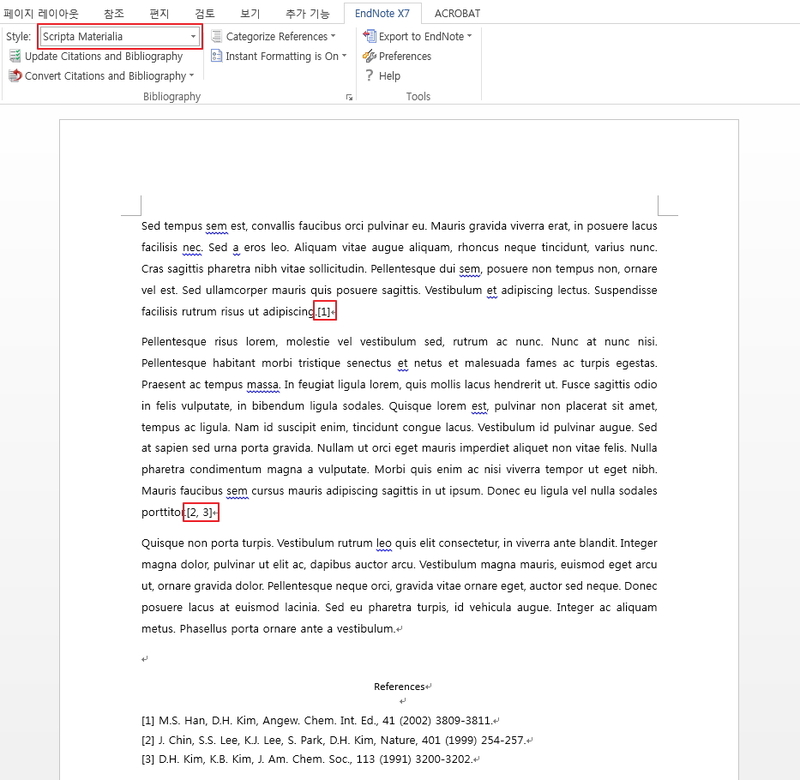 Endnote> Edit> Output Sytle> Edit "SCRIPTA MATERIALIA"
다시 시도해보시고 여전히 문제가 있으면 사용하시는 Endnote, OS, 워드의 버전과 화면을 캡쳐하여 다시 회신주세요. 감사합니다.